TyTune® delivers consistently accurate tuning of your pipe band bass or tenor drum to the complex highland bagpipe scale without the need to transpose from concert pitch to bagpipe pitch. TyFry® has collaborated with Murray Blair (Bagpipe Tuner) to produce the world’s first pipe band bass and tenor drum tuning application for iPad, iPhone and iPod. 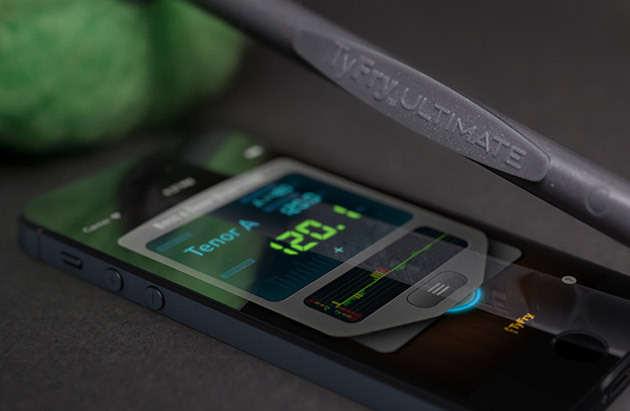 Just like the Bagpipe Tuner (available on the App Store), TyTune® integrates decades of studies and research on drum and bagpipe frequencies, harmonics and overtones providing the strongest and most accurate reflection of your drum’s fundamental note relative to the highland bagpipe. Easily tune your pipe band’s bass and tenor drums to any note on the bagpipe chanter scale with TyTune®’s simple pushbutton format. Enter the bagpipe Low A frequency in which your band is tuned (Eg. 480Hz) or determine the frequency by having your band’s reference bagpipe play Low A and clicking “Learn”. TyTune® will automatically calibrate the respective notes on bagpipe chanter to your bass or tenor drum at that frequency. Select your desired note and the tuning bar or numerical frequency section allows you to see the degree to which your drum is sharp or flat of that target note. It’s then just a matter of fine tuning by equally increasing or decreasing the tension on both top and bottom heads until you achieve your desired note on TyTune®. TyTune® expels extraneous frequencies outwith the range of pipe band bass or tenor drums allowing tuning to occur in any noisy or band environment. TyTune® can be set to “Normal” or “High” filtration which can be used in any noisy environment involving other instruments or sounds within the range of the bass or tenor drums. The colour of the numeric reading changes on the screen when the drum is within the range of the target note to make tuning easy to see and understand. TyTune®’s “Help” feature allows you to better understand and learn how to use the many features available within the app. TyTune® is available to download on the App Store for iPad, iPhone and iPod.